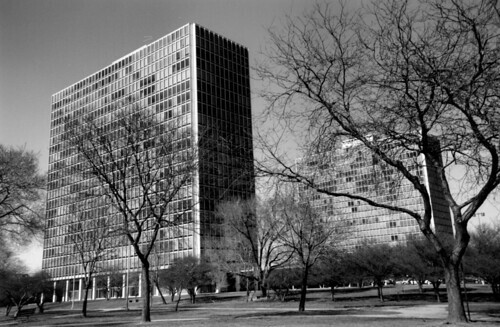 Lafayette Park in Detroit consists of three high-rises, 24 single-story courthouses and 162 two-story town houses, completed in the early 1960s. It was an urban renewal project built on land that was once a working-class black neighborhood. It was designed by one of the 20th century’s most famous modern architects, Mies van der Rohe. All these elements have spelled disaster in other cities, and yet Lafayette Park has been a success, with high occupancy rates, a racially diverse population and a strong commitment to maintaining Mies’s architecture. In their new book, “Thanks for the View, Mr. Mies,” which is due out at the end of the month (Metropolis Books, $29.95), the editors Danielle Aubert, Lana Cavar and Natasha Chandani, graphic designers all, offer a portrait of Lafayette Park very different from the classic Mies monograph. Contents include interviews with residents of Lafayette Park’s towers and town houses; archival materials from the complex’s history; an account of nine days spent trying to climate-control a corner apartment; and essays on Mies in Detroit, the Lafayette Park landscape, bird-watching and a record of bird-strike deaths (birds and plate glass don’t mix). At-home portraits of residents by Corine Vermeulen show Mies’s architecture as a strong frame for personal expression. Some homes look like shrines to 1958, while others reflect the lived-in décor of decades. Jacqueline Neal, an interior designer and 12-year resident of the Pavilion, the smallest of the complex’s three towers, spoke last month about living and accessorizing with Mies. What kind of interior design do you do? For the past 17 years, I have been doing commercial design, corporate offices, working for C.E.O.’s. But the commercial industry has not come back as quickly as residential furniture. Residential is not difficult for a designer. How did you come to live at Lafayette Park? Design-wise, what do you like about the Pavilion? I like the floors and the green marble walls in the lobby that are accented with chrome trim and chrome elevator doors. The housekeeping staff does an excellent job in maintaining the space. The floors are always done. Everything is original. When you invest in quality, you do get what you pay for. That’s a sad thing a lot of people don’t understand or appreciate. Click HERE to read the full story on The New York Times (dot) com!